The big day is fast approaching…8 more weeks until the due date! D was very punctual, arriving right on her due date, so we’ll see about this little guy. This pregnancy has had its own set of challenges, but it is going by so much more quickly than the first! Toddlers keep you busy! Though we’ve been mentally preparing for months, we are just now starting to prepare our home (and all those new-baby logistics) a bit more. A big difference in our preparation for this baby is that we have another family member to consider. D has had the privilege of being the first and only for almost two years, and this is going to be a huge adjustment for her. Though I am confident she will love our new baby, I expect there to be lots of bumps along the way. While we can’t predict exactly how she will respond to such a big change, we can help prepare her for what’s to come, and help get her more comfortable with the idea of a tiny baby brother around. 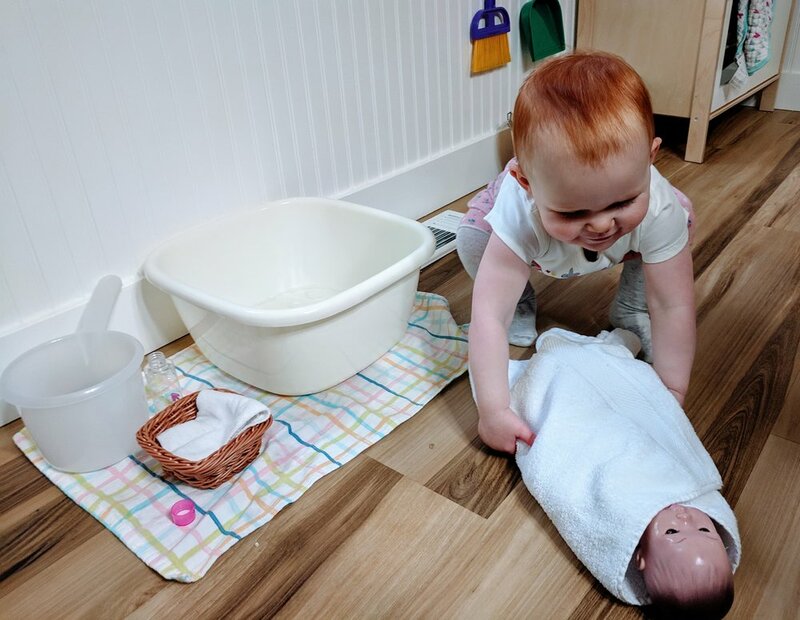 Caring for Baby - Though I introduced baby dolls around 15 months, she really only became interested in her dolls around 18 months. This was when she began to insist on sleeping with one (now two), pretending to feed them, and changing their clothes. It was at this point we set up a little baby care basket, which you can read about in this blog post (along with a couple of other baby activities). More recently, D’s favorite thing to do is wear or push her baby doll around the house. She is especially in love with this Boba doll carrier, which allows her to multitask (just like mama will be doing very soon!) Giving her these opportunities is fun for her, and good practice too. I can definitely see us both wearing our babies around the park in a few months! Baby Washing - Her other favorite baby care activity is baby washing. We just started this activity (21 months), as it requires quite a few steps. After I set up the supplies, we start by filling this water ladle. For now, I fill it partway at the sink, and she carries it and pours the water into the water basin. We usually do two or three rounds of this. 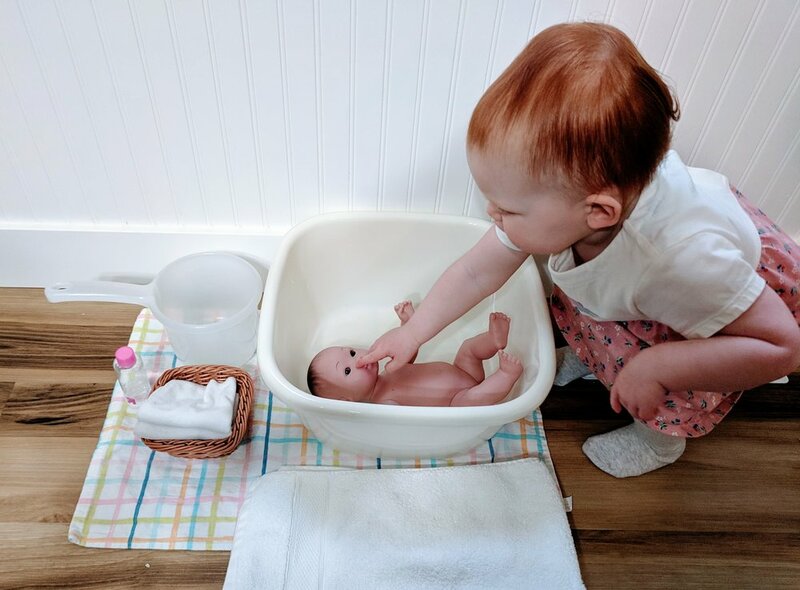 Then she dampens one of the baby cloths, pours the liquid baby soap on the cloth (or in the water usually), and washes the baby doll’s face and body. She likes to name all the body parts as she goes. Then I hand her the other small cloth to wipe baby’s face dry. We then lay out a small towel and she puts baby on it. I help her wrap up baby and she likes to snuggle her baby doll in the towel. Baby Photos - D’s favorite book in our house is her baby book. While I’m happy for her to look through this with me, it is not a book I want to leave her to play with. So I printed a few pictures of her in her first few months, and laminated them for her to look through. Seeing these photos of herself will hopefully help prepare her for what her little brother will look like when he is born! (Though red hair twice would be crazy!) It also helps to get the conversation going about newborns in general: what they are like and what they need. Books - There are many books out there on this very topic, but here is our small selection. I didn’t want to purchase too many, as that gets repetitive, and I didn’t want to overwhelm D with the idea. You Were the First is hardcover, but a wonderful book to read together at bedtime. It is such a sweet story of experiencing all the firsts with your firstborn, and I think it will be extra sweet to read once D is a little older too. Two of these books (Waiting for Baby and My New Baby) are part of a new baby series. I like the questions the toddler asks about the baby or baby-to-be along the way. It’s great for starting conversation about pregnancy and the new baby. Lastly, I’m a Big Sister is a classic short story about the important and fun role big sisters have with a new baby, which is also helpful for us! Environment - Since D already has her own room, and a floor bed, we haven’t had to make adjustments to her room for a new baby. Instead, we just make sure her room is a place she enjoys being and sleeping, so that she always has that space for herself (no sharing necessary). Hopefully it will help her feel “big” and special to continue to this room to play in, read in, pick out her clothes and dress (see that post here), and sleep with her favorite “lovies”. Though we only keep a few “toys” in her room at once, we keep lots of books, and her favorite place to read and snuggle is in her play tent. I am looking forward to continuing many bedtime snuggles with her here when our little baby is sleeping. Though we have yet to set up the baby’s room (it’s currently our guest room and we would like to paint it and make some changes first…), we are working on setting up a small area of our bedroom for baby. That is where the little guy will sleep for the first 5-6 months. I’ve been involving D in filling the baby’s drawers with tiny clothes and hats, and showing her where baby will sleep, where I will nurse him, and where we change his diapers. My hope is that this will help her feel aware of and included in some of the changes about to take place. I’m sure she will enjoy picking out his outfits when the time comes! One-on-One Time - I have been soaking up these last few months of all the special solo time D and I have. Though I know we will carve out time for just us two, it is bittersweet to know that it will be more than just us most of the day, and I worry how this will affect her the most. Because of this, we’ve been making sure she has special solo time with her Dada each week too. Each Saturday morning they spend a couple of hours just them, and I’ve found that after their little adventures, she’s all about Dada the rest of the day. It’s so important for them to have that time together, and my hope is that their bond will be even stronger when he’s on paternity leave and our newborn is at his neediest. Once the baby is here, solo time with each of us will be extra important!